This was the first clue posted, on Friday 10th May. 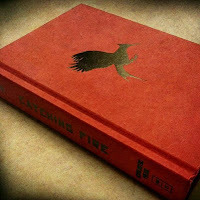 It shows the exterior of a copy of the hardback Catching Fire book. The sepia tone seen here is replicated throughout the rest of the clues. 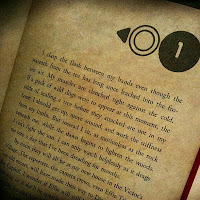 This clue was posted the next day (Saturday 10th May), and shows the opening page for the first part of the Catching Fire book. In keeping with the regular theme, this clue was posted the day after (Sunday 12th May). 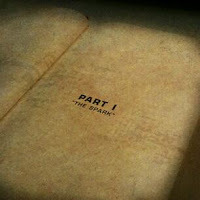 It shows the first page of the opening chapter of the Catching Fire book. 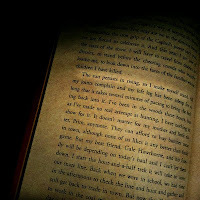 This last clue was posted today (Monday 13th May), and shows a page from the Catching Fire book. Notice how one of the lines is highlighted. It reads: "The sun persists in rising, so I make myself stand." This is a quote from Katniss' POV. What could it mean? There have been many theories floating around about what this surprise could be. Some include: new stills, new portraits, Mockingjay casting, or perhaps a new trailer! It seems there may be a continuation of the victory tour content previously seen in the MTV teaser trailer. All will be revealed tomorrow. If Lionsgate's previous marketing campaigns are anything to go by, this is going to be truly epic! Stay tuned tomorrow for all the latest updates.